Weissbort’s landscapes lovingly document the fields, downs and villages of his adoptive country, but range equally through Europe (Austria, France, Belgium) and beyond. The present painting is a townscape: a tumbling fall of tiled and slate roofs in Ostend, the repeated and opposed oblongs and rhombuses creating an almost abstract pattern across the canvas. This type of view has fascinated many artists, including Cézanne (The rooftops of l’Estaque, The sea at l’Estaque), Gauguin (The blue roofs of Rouen), James Ensor (Rooftops of Ostend) and Charles Rennie Mackintosh (Slate roofs of Fetges, La ville). Most of the latter have set their particular arrangements of roofs within the landscape they inhabit, whereas Weissbort’s roofs fill the canvas, apart from the furthest horizon, giving Ostend almost the scale and panorama of a city. Here it is closest to Ensor’s Rooftops of Ostend. The colouring is also unexpected, the whites, greens and sunny terracottas looking away from northern landscapes to the Mediterranean – perhaps specifically to Florence – in a way which Ensor does not achieve, in spite of his saturated hues. 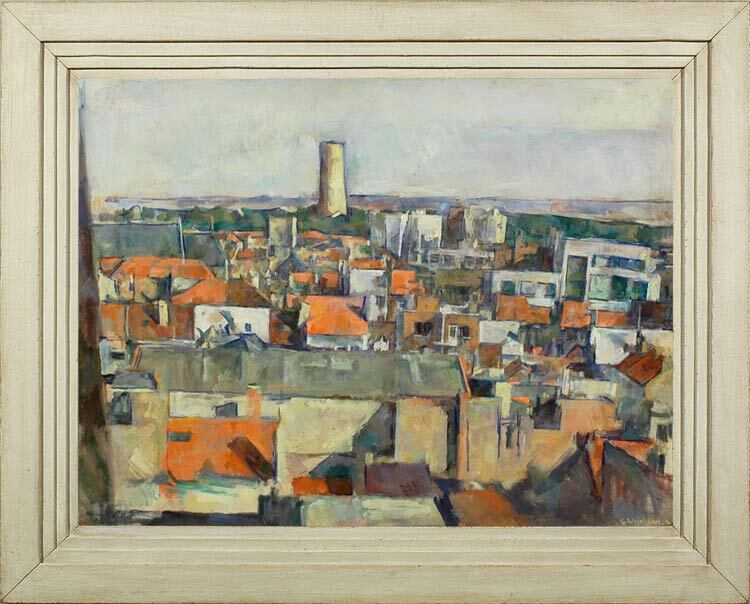 In this context, the large tower or chimney in the background carries resonances of the campanile of the Duomo, linking it to an idea of the Renaissance, at the same time that it is stylistically clearly related to Cézanne’s depictions of the little Mediterranean towns and villages around Aix-en-Provence. George Weissbort (1928-2013) was born in Belgium and moved to London at the age of 7. He attended the Central School of Art & Design (now St Martin’s) where he was taught by Ruskin Spear and Rodrigo Moynihan. He was influenced by Arthur Segal to move from the abstract expressionism of the 1940s to realism, and by Bernard Meninsky, who taught life drawing at the Central School, to study the Old Masters. He turned first to artists such as Cézanne and Matisse, and later to Vermeer, Chardin, Velasquez, Corot, Titian, Holbein, and Piero della Francesca, amongst others. He exhibited regularly at the Royal Academy, the Royal Society of Portrait Painters and the Fine Art Society. In 1964-65 he had a large exhibition in Paris, and in 2006 he had a one-man retrospective at the Chambers Gallery, London, followed in 2008 by another at the Denise Yapp Gallery, Whitebrook, Monmouth. He wrote essays on art and criticism which look both at the techniques of making a painting, and of appreciating a work of art. The latter skill he believed came only after years of consciously training the eye to see as the artist saw, considering for example the ‘negative’ spaces around and between objects. He also discussed the work of specific artists, such as Lucien Freud and Vermeer. His obituary in The Independent quotes Brian Sewell, a friend, as saying of him that Weissbort ‘painted the right pictures at the wrong time’. His appeal was to those who understood his models and influences; he could be described as a painter’s painter, and the same obituary quotes Paula Rego describing him as ‘a truly honest artist who knows so much about painting’. Publications: George Weissbort, Paintings and Drawings (Parnassus, 2008), ill. 130 colour plates; includes transcripts of a filmed interview; essays by Tony Rudolph, David Lee and Bernard Dunstan RA. YouTube video: A tribute to George Weissbort by John French.